What is a sale deed and why do you need it? How is the sale deed prepared? What information does the sale deed contain? When it comes to buying a house, there are a number of details that you have to bear in mind, especially if you’re a first-time homebuyer. One among the important documents required is the sale deed. The sale deed is an important legal document that evidences the sale of a property has been made in favour of the buyer from the seller. It also acts as proof that the buyer is the absolute owner of said property. Read on to learn some vital sale deed details. A sale deed is a document drafted at the time of sale of a particular property. If the sale deed has not been signed by the buyer and seller, the sale of the property is not legal. The sale deed is also known as a conveyance deed in some states. It holds details of the previous owners, locations and dimensions of the house. The amount you paid for your home is also recorded in this document. In the sale deed, the seller categorically states that the property is encumbrance-free and that it is being sold to you of his own will. The signing of the deed signifies that the process of sale has ended. It is executed only when both parties are satisfied with the terms and conditions mentioned in the deed and are ready to comply with them. 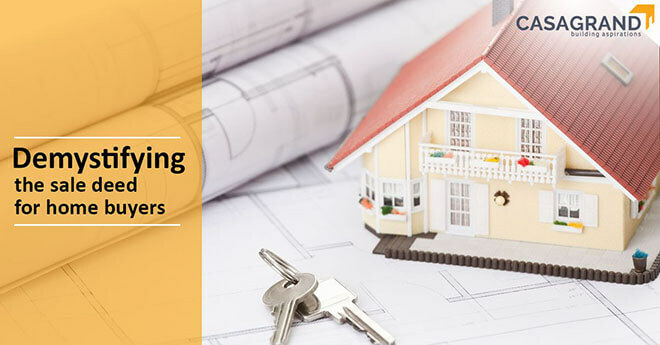 The sale deed is always drafted on non-judicial stamp paper, the value of which is set by the state government in which the transaction is taking place. Every state has its own predetermined value of stamp paper that is used for drafting a sale deed. At the time of signing, there must be at least two witnesses with all their details included in the sale deed. As per the sale deed format, it must include the names, residential addresses and ages of both parties involved, with both parties being clearly labelled as buyer and seller or lessor and lessee in the agreement. The sale deed is deemed invalid if all the required information is not provided in full. This includes the property’s location, plot area, the number of rooms, balconies, any additions made to it, etc. This is the part of the document that is agreed upon and signed by both parties, and it precedes the property deed. The agreement will clearly state that both parties are agreeing to the transaction and will list out details like date of the transaction, advance paid, amount due, mode of payment, etc. Once the sale deed is signed by both parties, the buyer gets full rights to the property and becomes its legal owner. Once signed, this cannot be revoked. Once the deed is signed, the final step is registration. Under this process, the deed is registered under the Registration Act of 1908. Both parties involved must be present at the sub-registrar’s office, along with all the relevant documents and two witnesses to sign and close the deal. Once signed, a certified copy of the registered property bearing the buyer’s name will be available at the sub-registrar’s office. • All the required documents must be original and produced within four months of registration of the deed. Photocopies will be considered invalid. • The buyer is in charge of paying stamp duty and registration charges. • The seller must ensure that all payments related to property tax, water and electricity charges, cess, etc. are paid prior to signing the sale deed. • If the need arises to transfer the property to a relative or family member, one can transfer ownership interest via a quit claim deed. It must hold the full names of the transferor and transferee to avoid any conflicts regarding the property. With the sale deed holding so much importance, it’s best not to rush into signing it. Take your time and go through all the details before finally penning your name. The real estate market has its own set of rules and regulations to be followed. You can read our blog on how to make sure the property you buy is legally clear for more information. While looking for your dream home, head out to Casagrand, one of India’s top and most trusted builders.